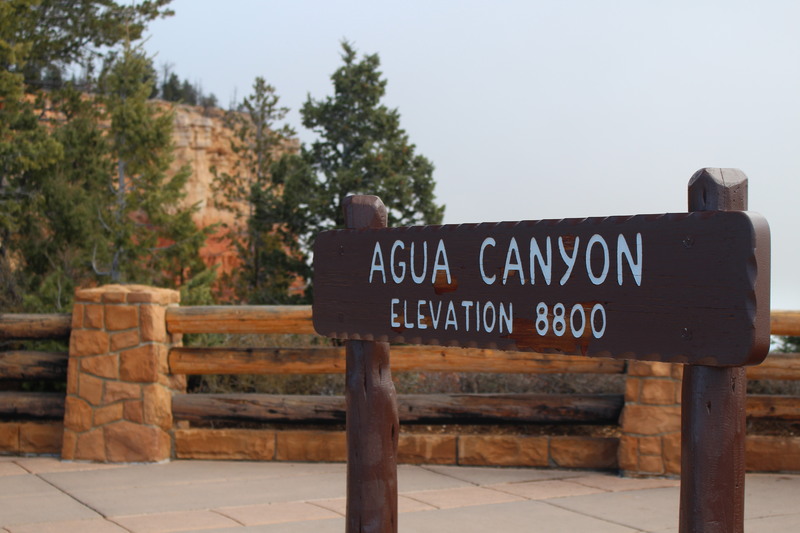 Seven things you must do at Bryce Canyon National Park | Oh, the Places We See . . . It probably goes without saying that most people visit Bryce Canyon because they’re trying to check off all the national parks in Utah. Or they’ve heard of hoodoos and want to see them. But actually, there’s more to Bryce than just another national park experience. Here are seven things we consider must-do’s at Bryce Canyon National Park. You might as well begin here in this historic structure of Arts and Crafts design. Built between 1924 and 1925, the oversized log construction welcomes you to “sit a spell” on its long front porch, snuggle up to the massive fireplace, dine in the restaurant, or head out the back door path to stand in front of the canyon itself. Now managed by Forever Resorts, the Lodge at Bryce Canyon has no cell phone service and pretty much all the quiet you come for. Closed this year from November 6, reopening on March 23, 2018, the lodge requires that you check for availability of rooms and cabins early through their website. 2. Go early but stay the day! Mornings begin way before sunrise, and you want to position yourself at Sunrise Point for a breathtaking view, for sure. You may even get lucky and see fog lifting, revealing one hoodoo at time until the vista opens up wide before you. But don’t think morning is the only time of the day to see Bryce. What we’ve learned about canyons and red rocks out West is this: they stay always the same. It’s light that makes the difference. As the day breaks and Ol’ Sol puts his spotlight on first one formation and then another, the reveal can be something to behold. When fog lifts at mid-morning, you get an even better view. Stand in one place for a while, and you’ll get several changing views. As the sun shifts its spotlight, other formations become highlighted. Or drive one way along the paved highway and then stop to take a look. But drive the reverse direction for a different sight, based entirely on light and weather. Any time of day is “all good” at Bryce. Even with full mid-day sun, you get shadows and interesting patterns. 3. Enjoy the drive and the stops along the way! Not all of us have a vintage Edsel to tool around in at Bryce. But what fun we had talking to a visitor who had just bought this primo vehicle to see the USA in style! At each turnout, we took pictures of signage around the viewing areas. (Makes it easy when you’re curating that slide show for the family and you want to show what you saw and where.) 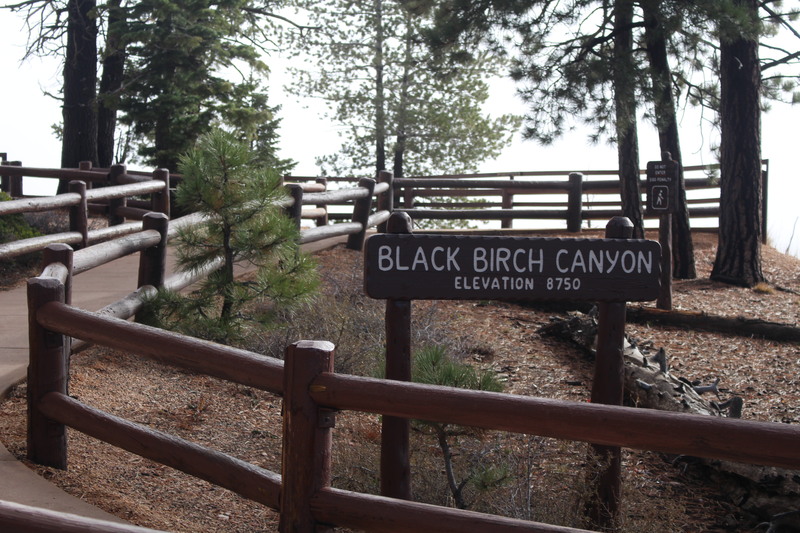 And kudos to the park service for premier paving, clean restrooms, and railings that blend in naturally. Bryce is first class in appearance and accommodation. 4. Look at nature — all of it! At first glimpse, you’ll notice what’s closest — an arch, a statue-like formation, a shape you see in the rocks. But if you look beyond the pinkish, white-topped formations, you’ll realize there’s more nature that you could have missed, if you hadn’t paid attention. Sometimes you don’t see the forest for the . . . rocks. Balanced on the edge was this single tree, roots extended, welcoming the morning light. Look closely, and you’ll see patterns in the bark of nearby aspens. At Farview Point, this rain-and-wind eroded arch forms a window on a forested section. 5. Follow a trail — and your heart! Now here’s an example of doing what we tell you to do, not what we did. How we missed this is beyond both of us, but we never knew that we, minimal hikers at best, could have enjoyed the trails down and around the passageways at Bryce. Hikers prepare to head down the trail into the “bowels” of Bryce. When we looked down into the center parts of the formations, we realized that there were people walking casually along smooth trails with little more than a walking stick for support. And we could have done that! Next time, this will be us! As sure as we hope there’s a next time to visit Bryce, we can guarantee we’ll grab a map, talk to a ranger about the best places for casual hikers to go, and take a hike. There’s something about being in the bowels of a canyon that can’t be duplicated when you stand at street level and look down. Or at least that’s what we think. We’ll tell you after our next trip! 6. Take pictures. Lots of them. For most of our readers, there’s no reason for us to post this mandate. You already have gear galore whether it’s a pocket-sized phone with a camera or a two-foot long lens on a fancy apparatus. Walking to the edge for another great shot of Bryce Canyon! Shutterbugs use all sorts of equipment to best advantage. Some walk to the edge and snap away. A lone photographer focuses on the unique structures at Bryce. Others set up their tripods before dawn to capture first light. But it bears repeating: charge your batteries and get a spare memory card. Bryce is worth remembering. 7. Look beyond the hoodoos. It’s easy to earmark Bryce as the hoodoo capital. But there’s so much more. That sense of being a small part of a very large planet is what you get at Bryce, especially if you look beyond the amphitheaters and nearby formations. Looking at the big picture puts it all into perspective. From layers of colored stone . . .
Variegated layers of stone on a Bryce Canyon bluff. to “statues” and towers formed by wind and rain. There’s beauty of all types, colors, and kinds here. Looking up close yet beyond — a magnificent view at Bryce. Finally, it’s hard not to sound trite when describing something as vast and magical as Bryce Canyon National Park. And each visitor takes away something different from the experience. Looking into the distance at Bryce. If you’ve been to Bryce, let us know what you liked best. And if you haven’t been, here’s hoping you get there. It’s nature at its finest. With the wind and rock at our backs, enjoying Bryce Canyon! To read all our posts on the national parks in Utah, go to Travel Series: We Saw Utah here. This entry was posted in Photography, Utah, We Saw Utah! and tagged Bryce Canyon National Park, hoodoos, The Lodge at Bryce Canyon. Bookmark the permalink. Nice photos! We didn’t have enough time in Bryce, but we did manage to get a trail ride in, which was awesome! Thanks so much for taking a look. And that Edsel? What I wouldn’t have given for a ride just to say I’d done it! Thanks, Amy. I’m beginning to think that “fog is your friend.” I love looking out into my backyard in the morning and seeing fog. It’s something you can’t plan for very well, but a welcome surprise! Here’s hoping your fall is lovely! Love the tree with the exposed roots. We did, too. Had no idea it could grow on what appears to be barren land. But a very striking image! I’m totally enchanted by the hoo doos but the Edsel is running a close second – what fun! I would have paid to ride in that Edsel. But the owner whom we talked to for a while didn’t offer! But wouldn’t that have been fun!